During the weekend of October 20th and 21st, a remarkable convergence between art and music took place in the Olivier Music Barn within Stephen Talasnik’s exhibition, Unearthed. On Friday, the violinist Angella Ahn played pieces by J.S. Bach, Vaughan Williams, Kenji Bunch and Mark O’Connor. On Saturday, the cellist and Dean of the Honors College at Montana State University, Dr. Ilse-Mari Lee, performed the premier of her composition, Unearthed, written for the occasion of Talasnik’s exhibition, as well as all six preludes of J.S. Bach’s unaccompanied Cello Suites. While Tippet Rise has always embraced the relationship between music and art, the harmony was even more striking when sitting amidst Talasnik’s sculptures, on display at the art center through this Sunday, October 28. Throughout the Music Barn, models from Talasnik’s original Satellite Series are placed on austere platforms. Two of his pieces, Archaeology (2012) and Galaxy (2014), hang from the barn’s larch walls, contributing to the acoustics and the geologic feel of the hall. 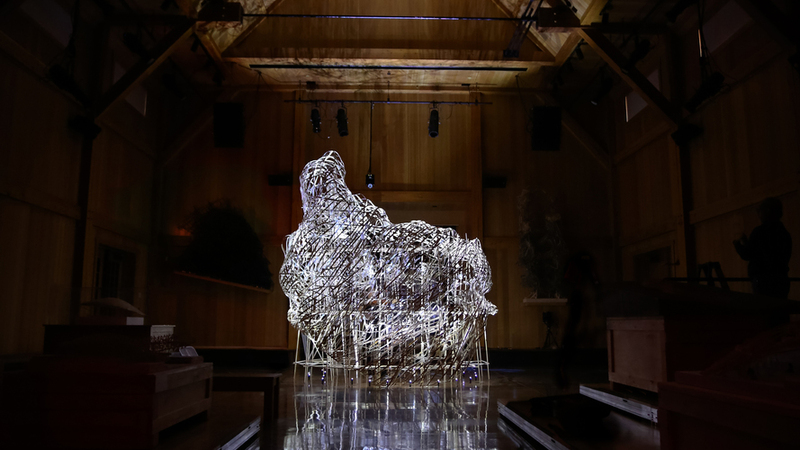 This weekend, audience members sat on directors’ chairs scattered amongst Talasnik’s works watching the performers in front of and within the exhibition’s stunning bamboo centerpiece. Called Hive, the organic, habitable, architectural sculpture was hand-woven on site by Talasnik last week in the days preceding the exhibition’s opening events. “That was pure magic,” said one audience member to another moments after Dr. Lee drew the final note of Unearthed from the strings of her cello. And, it was. The Music Barn’s lights were turned off for Dr. Lee’s performance of the piece. In the near-dark, the sounds she plucked and bowed from her instrument rolled from within Hive into the room, through and above the audience, weaving with the booming notes of a simulated thunderstorm. As Dr. Lee played, Hive, lit from below, rose luminescent in the darkened room, like an iridescent glacier from a midnight Arctic sea. For more information about Unearthed, on display through this Sunday, please click on the link below. We hope to see you here! Photo of Hive by Melanie Nashan.